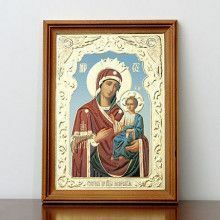 Russian monks living and working in Sofrino monasteries crafted this Icon which features the Holy Mother Mary in a hooded robe and Baby Jesus. 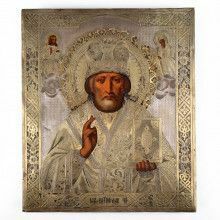 The entire Icon is accented with a gold leaf background and framed on a slab of wood. 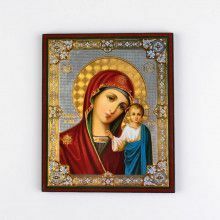 This particular icon is called the “Platytera" which stands for a title of the Virgin Mary- “Platytera twn Ouranwn"- “More Wider than the Heavens."